Originally posted at Romance Around the CornerSource: a review copy was provided by the publisher through NetGalley.I don’t know what to do with this book. 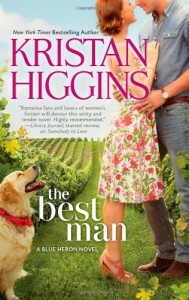 It’s one of Ms. Higgins’ most entertaining, fun novels in a long while, especially since she made the transition from Chick-Lit to Romance, but it’s deeply flawed, and in many ways, unforgivably so. When I was done reading it, I was left with a bad aftertaste that did nothing but get worse the more I thought about it. Faith, as is the case with most of Higgins’ heroines, has the worse luck with men, which is unfortunate since all she wants to do is settle down, marry and have kids. She was in love --or at least thought she was-- with her high school sweetheart, Jeremy. They were the town’s golden couple; the prince and princess of their own perfect fairytale. But during their wedding ceremony they were interrupted by Levi, the Jeremy’s best friend and best man, who couldn’t let them get married, because he knew the groom was gay.Two years later, she’s been living in another city, enjoying professional success, but unhappy because she can’t get a decent date. When a convenient excuse arises, she goes back to her hometown where she’s forced to confront her past, Levi and a mutual history that goes beyond what happened at the wedding. I found the romance so appealing and engrossing that it was hard for me to take a break from reading. It’s a love story we have read many times: the golden girl and the bad boy from the wrong side of the tracks who never even dream of trying to make it work because they are so different. He doesn’t believe himself worth of someone like her, but instead of changing for her, he writes her off as an impossible, moves on with his life and discovers his own worth. She, on the other hand, thinks she has found the love of her life in another man, but is in for a rude awakening. So when they finally get a chance at love, it feels a lot like a second opportunity.There were interesting class issues that gave the plot an underlying dark tone and the main characters, the hero in particular, depth and complexity. And the leading couple was likeable and had incredible chemistry. As I said before, it’s been years since Ms. Higgins delivered so much fun, entertainment and heart, which makes what I’m about to say even harder and more infuriating.Higgins knows how to use over the top and trite plot devices and tropes for great effect, both comedic and dramatic. Her small towns are filled with quirky, lovable characters that facilitate all sort of ridiculous circumstances and infuse the book with a sweet miasma that permeates into every aspect of the story. But this has never bothered me before and it wouldn’t have bothered me here if not for the actions of some of the secondary characters in conjunction with the heroine’s.Faith’s father has been widowed for years and years. He’s finally dating again, but unfortunately for him, the poor woman and the reader, he chooses someone his family vocally disapproves of. Her sin? Looking like a gold digger. And to these characters a gold digger looks like someone who dresses inappropriately for someone that age and has an exuberant personality. This was an indicative of the prejudice to come and I wish I would have paid more attention to it.When Faith and the rest of the family arrange a blind date to rid their dad of the unwanted woman, they set him up with someone who ends up being --I quote-- a “she-male”. They wait until the woman leaves and then laugh and tease their dad. I had to read this scene twice to convince myself that I was reading it right. Using transsexual characters for the only purpose of getting a cheap laugh out of them is a deal breaker for me. I found the careless transphobia appalling, and I couldn’t believe that no one involved in the production of the book (author, beta readers, editors, etc.) noticed this. Maybe this comes from a place of ignorance and not real hatred, but that doesn’t make it fine. And then there are the small things, like lots of references to slutty shoes and slutty outfits. Or when a young Levi takes a look at Jarred and immediately knows he’s gay. And when the story begins, Faith goes on a date with a man whose wife confronts them and instead of calling him on his behavior, she attacks Faith and repeatedly calls her a whore. All these little things become jarring, disturbing and hard to ignore once we add them up.I’m conflicted. I read the book in one sitting. Even after the incident with the father I decided to keep reading, because I wanted to know how it all ended. But as much as I enjoyed the novel, I was left with the uncomfortable and unhappy feeling of having read a book whose flaws irrevocably tainted the original enjoyment.